29 year-old Madhurika Patkar won her first ever Indian national championship title in the Women's Singles on Sunday 5th February 2017. 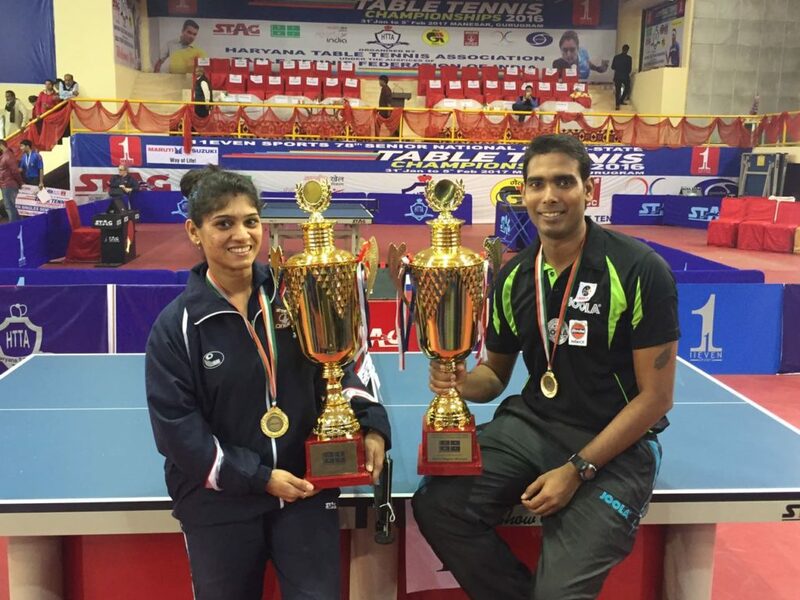 She downed Poulomi Ghatak to emerge the winner of the 78th 11Even Sports Senior National and Inter-State Table Tennis Championship- 2016, held in the city of Manesar, located in the northern Indian state of Haryana. After winning the final point, Madhurika broke down into tears of joy while the crowd gave her a standing ovation. Staying true to her values, the six time national champion Poulomi Ghatak walked to the other side, patted Madhurika’s back in appreciation and congratulated her. Madhurika beat Poulomi in straight games (11-5, 11-9, 11-5, 12-10) to clinch the title. Despite Poulomi’s best efforts to be aggressive in her serve and third ball attacks, Madhurika played a brilliant combination of attack and defense which helped her remain dominant in the game. She beat youngster Manika Batra in the semi finals in a thrilling six games encounter, a game that was well contested between the two. Madhurika remained patient yet aggressive against Manika’s deceptive game. She won (7-11, 11-8, 11-9, 11-8, 10-12, 11-8). “I never thought of the outcome, I always thought about how to win the next point. I was a bit reckless in the initial rounds, but I realized my mistakes and made sure I did not repeat them,” she added. This win brought out the confidence and belief that existed deep inside her, but always remained hidden. “Winning this championship has given me a different kind of confidence that I never had. I can take that with me at the international level. I have been playing well against international players but was never able to convert it into a win. I am confident that I will do well now,” said the self assured Madhurika. “My aim is to win a gold medal for India in the upcoming Commonwealth Games in 2018. Our coach from 2010 Commonwealth Games, Massimo Costantini is back, the training has been great so far. I will do my best to fulfill this dream,” she added. Certainly, with a renewed confidence along with the resources to fulfill her dreams, Madhurika Patkar, the new Indian National Champion, has her target set, and this is just the beginning. Women’s Singles Quarterfinals: Madhurika Patkar beat Krittwika Sinha Roy 4-0 (11-5, 11-9, 11-9, 15-13); Manika Batra beat Nikhat Banu 4-3 (8-11, 11-7, 11-6, 10-12, 5-11, 11-8, 11-4); Pooja Sahasrabudhe beat Shreya Ghosh 4-0 (11-2, 11-9, 11-4, 11-9); Poulomi Ghatak beat Archana Kamath 4-3 (11-7, 11-6, 8-11, 6-11, 11-7, 4-11, 11-4).